It’s Sunday which means another cookbook! 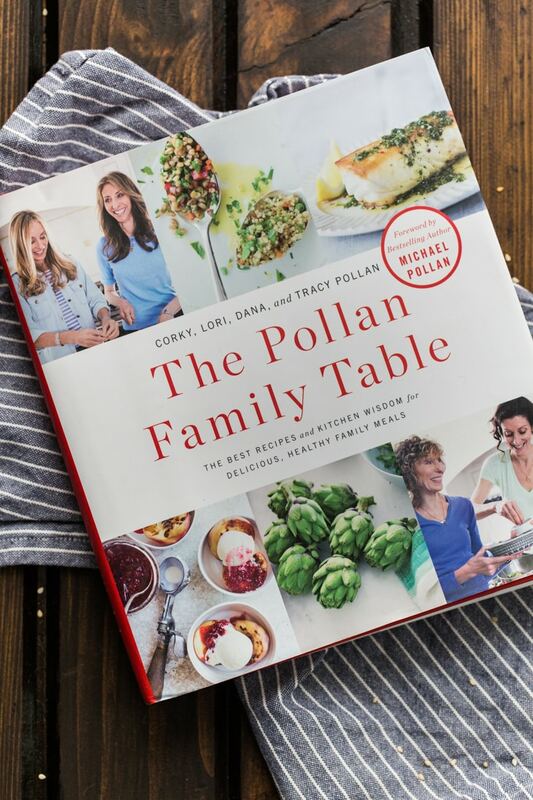 The Pollan Family Table comes straight from the family of one of my favorite food authors: Michael Pollan. Such a big part of the way we eat stems from how we were raised and the environment we surround ourselves with, so this cookbook was absolutely fascinating. All the recipes come straight from the women of the Pollan family (Michael’s three sisters and his mother.) I think what I love most about this book is that the recipes are approachable and easily inspire a hearty, healthy dinner that brings the family together. The book is divide into 3 chapters of the different meats, one chapter on vegetarian meals, pasta, soups/chilis, salads, vegetables and sides, homemade basics (like this teriyaki sauce) and desserts. The recipes are full of flavor and I love the use of grains and legumes throughout the book. So far I’ve tried the shaved brussels sprouts salad with pecorino cheese, spanish tortilla with spinach and manchego cheese, and the orecchiette with sautéed artichoke hearts, broccoli, and sun-dried tomatoes. The book also highlights pantry essentials and how to shop for each meal. 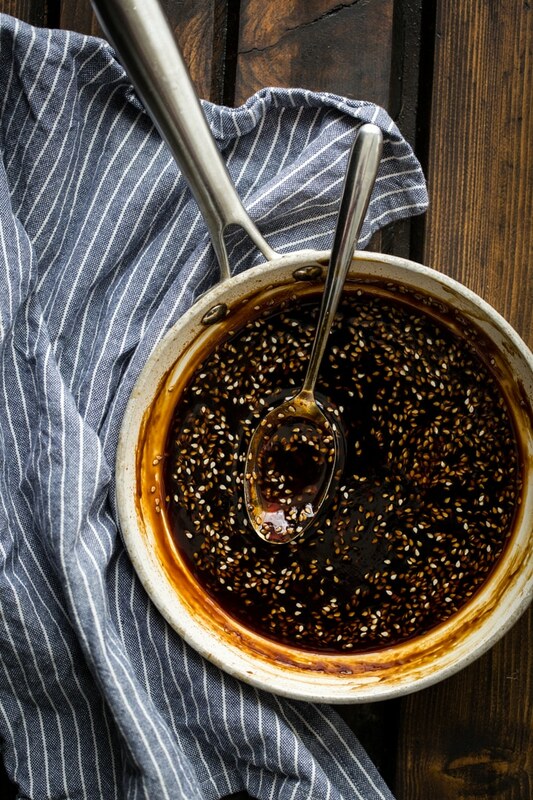 I wanted to share the teriyaki sauce from the book because it highlights one of the greatest things you can do for yourself: build a wonderful supply in your pantry. Each one of the ingredients in the sauce are items I always have on hand (including the garlic and the ginger.) While the mirin and sesame oil aren’t commonly used, I always keep them on hand for sauces like this or a bit of a kick in a noodle bowl or when making potstickers. 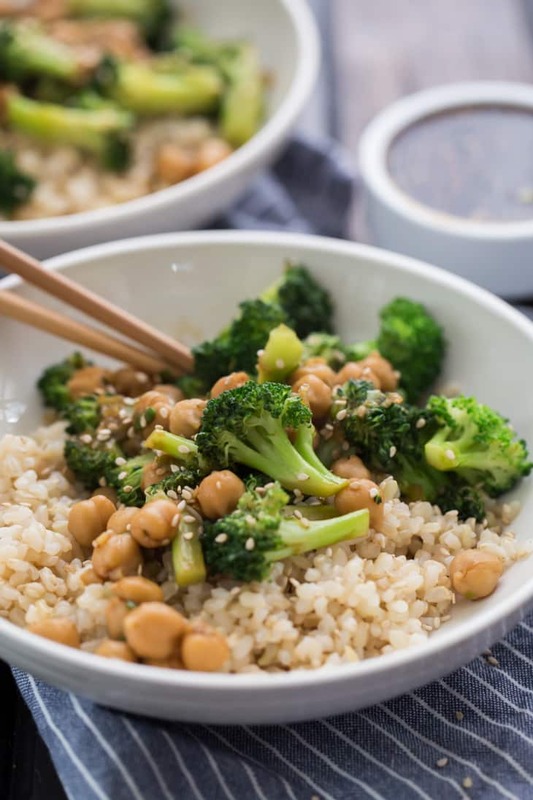 This broccoli bowl is one of my favorite, quick meals (even with making the teriyaki sauce, it’s still fairly quick.) And, if you have leftover chickpeas and teriyaki sauce, you can make these loaded sweet potatoes. In a dry skillet, cook sesame seeds over medium heat, shaking the pan occasionally until the sesame seeds are fragrant and begin to darken. Set aside. In a small bowl, stir together cornstarch with 2 teaspoons warm water. Set aside. 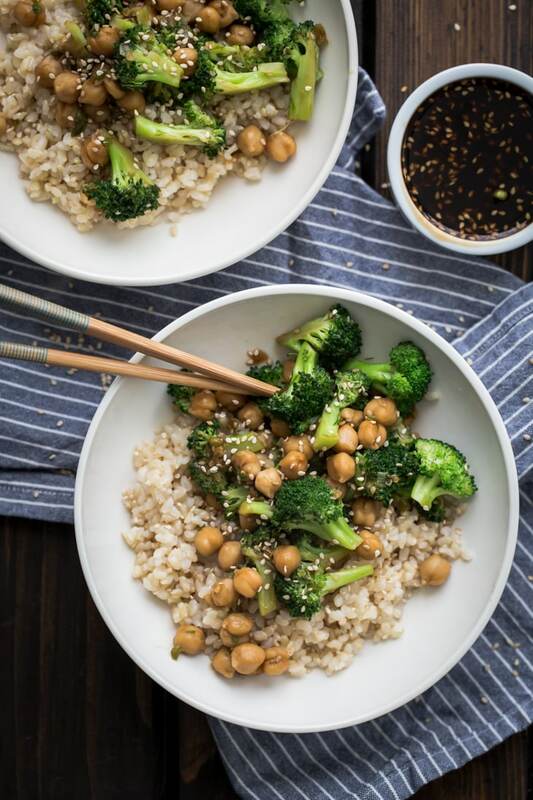 In a small sauce pan or skillet with high sides, combine the soy sauce with mirin, brown sugar, garlic, ginger, and 1/3 cup of water. Bring sauce to a low boil over medium-high, then reduce to medium heat and stir in the cornstarch mixture. Continue stirring until the sauce thickens, about 5 minutes. remove from heat and stir in the sesame oil and sesame seeds. 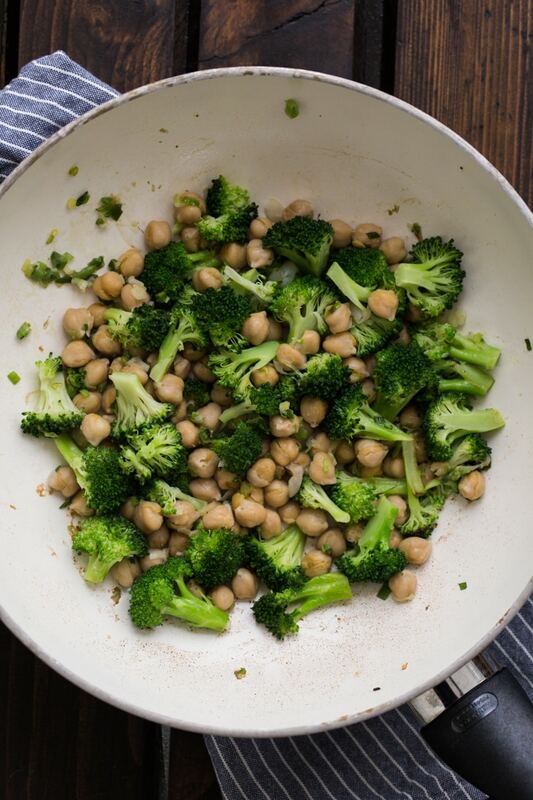 To make the broccoli bowl, heat olive oil in a medium skillet over medium-low heat. Stir in the scallions and cook until soft, 1 to 2 minutes. Add broccoli florets and let cook for a 1 minute. Add 3 tablespoons water to the pan, cover, and let broccoli steam until tender, 2 to 3 minutes (may be slightly longer depending on the size of your florets.) Remove the lid, stir in chickpeas and cook until chickpeas are warm. Add 1/4 cup of the teriyaki sauce and cook for 1 minute more. Serve on a bed of rice. *I’ve been known to sub in honey for the brown sugar. Definitely not the same but I like the overtone the honey adds. *Leftover sauce can be stored in the refrigerator up to a week or in the freezer for a month. *Teriyaki Sauce recipe is from The Pollan Family Table. Hello! This recipe looks fantastic. Thanks for sharing! Hello! Sounds like a great book! very healthy. Something I’d like to try. Thanks for sharing. Hello. 🙂 Thank you for sharing a simple and yummy recipe! I’d love to try it! Hello! This recipe looks fantastic I cannot wait to try it! 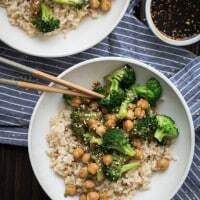 i don’t think I would have thought to add chickpeas to a teriyaki recipe, but I love it. This looks like a terrific meat free meal. Hello! I love chickpeas and so does everyone else in my family, so I’m excited to try this. Hello! I was just looking at that book at the bookstore the other day! Hello! I will never have enough ‘bowl’ recipes in my repertoire, so I’ll definitely be adding this one to the list. And I love the idea of unique recipes branching from basic ingredients! Recipes like these make everyday cooking that much more worth it. the sauce inspires me a lot. I’m Italian and I’m not very good with English … but this book …. must be my own! Can I participate in the giveaway even if you read from a distance? Yum! Sounds like my kind of book! I’m a total sucker for anything in “bowl” form over rice, so this sounds right up my alley! Yum!! Hello! This recipe is definitely getting tried out this month, as I’m doing Veganuary – not as easy as I thought it would be as a dairy-fussy vegetarian! Hello! Can’t wait to try this recipe. Hello and thank you! I love collecting great cookbooks about as much as I enjoy reading your blog. Hello! Thank you for sharing! Hello…Thanx for sharing the recipe. I love Michael Pollan’s books. And this looks like a great spin to change up the usual rice bowl. The teriyaki sauce looks especially tempting. Hello & thanks for the yummy recipes! Hello. Thanks for entering me in the drawing. Hello ! Love your blog, thanks for these recipe ! Hello, I would love to win this book! I L O V E a good cookbook! This one looks great! Can’t wait to try this out! Looks good! Hello! I love the sound of this teriyaki – I’m sure I’ll want to try making it. Hello! Can’t wait to try this recipe! Hello! Making this for dinner tonight…looks delicious! Hello! I love the photography in this post!
. . . hello . . . This looks delish! I’m not a huge fan of broccoli but I might try another green vegetable in this…maybe slightly wilted spinach or swiss chard. Hello! !, and thanks for sharing!! This recipe looks delicious! Hello! This cookbook sounds VERY interesting! Hello! You had me at chickpeas. Hello! Thank you for lovely recipe – I am very much looking forward to trying it out. HELLO HELLO HELLO! This looks DELICIOUS! Hello! Thank you for the opportunity … AND for the recipe! Hello! Can’t wait to try this recipe.! Hello! Thanks for sharing the recipe! HELLO! I would love this book! Hello and thank you for the offer of this lovely sounding cookbook! I’ve enjoyed your blog! Hello! This is totally my kind of meal! Thanks for the giveaway! Hello! And, that sauce looks amazing!! This looks like a perfect weeknight dinner recipe! I’ve been meaning to try your teriyaki chickpea loaded sweet potatoes for ages so thanks for the reminder to get on that. Hello. Your recipes are always fascinating and the ones I’ve tried have been delicious. Thank you. I’m looking forward to trying this one. Thank you for this incredibly delicious , easy recipe that I made for Meatless Monday. I had everything on hand when I came across your recipe. Garbanzo beans are a staple in my pantry. I loved the recipe, it’s quick and easy. I’m planning on using the wonderful remaining teriyaki sauce on some salmon for this Friday’s dinner. It’s Lent and fish on Fridays. Good Catholic girl here! 🙂 This dish would we great with a salmon for non vegetarian -meat eating diners. I added red onion and mushroom to it. I also served it over quinoa…it was life!